Movement disorders are comprised of a variety of conditions resulting in abnormalities in the motor system. These include such disorders as Parkinson's disease and other Parkinsonian syndromes, tremors, dystonia, tics and Tourette syndrome, and Huntington's disease. They can occur in all age groups from infancy to the elderly. In some cases, symptoms are restricted to problems in motor control while in others cases, cognitive and autonomic functions can be affected. UCLA first established its Movement Disorder Clinic in the 1960s under the direction of Dr. Charles Markham. Recently, the clinic has expanded into a multidisciplinary comprehensive program to address the diversity of needs of both patients and referring physicians. Our team consists of specialists in Adult and Pediatric Movement Disorders, Neurobehavior, and Stereotactic Neurosurgery to provide state of the art diagnosis and therapy for both adult and pediatric patients with movement disorders. In addition to patient education, medications, physical and occupational therapy, UCLA offers advanced techniques in neuroradiology, PET and SPECT scanning, stereotactic pallidotomy and thalamotomy, deep brain stimulation, and botulinum toxin injections. The goal of the Movement Disorder Program is to assist primary care physicians and neurologists in maximizing the quality of life of their patients and patients' families. 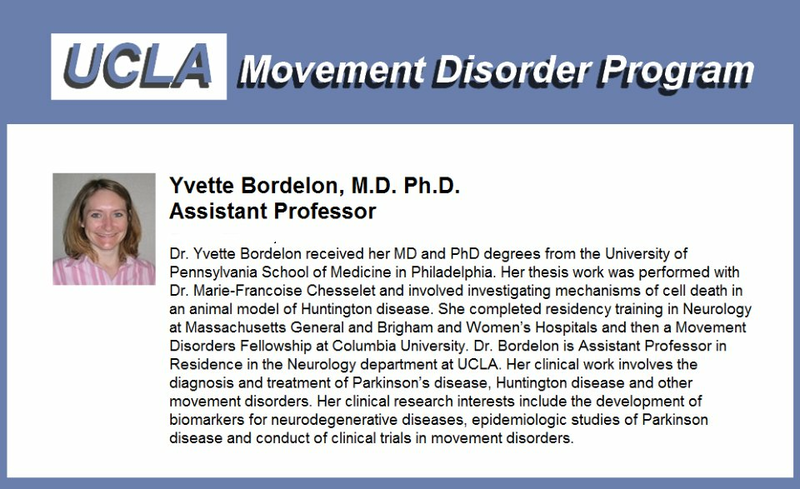 Program Faculty: Yvette Bordelon, M.D., Ph.D.